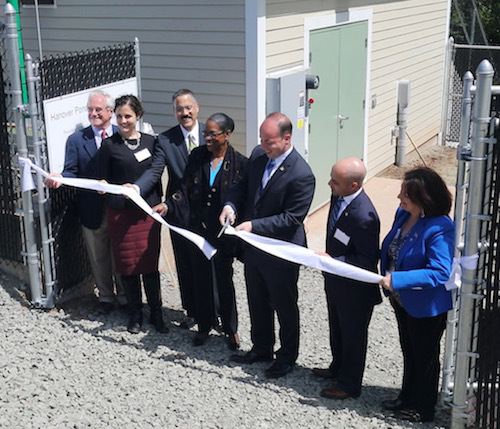 Mayor Kevin Scarpati of Meriden, Connecticut cut the ribbon to inaugurate the first Archimedes Screw Turbine (AST) electric generating facility in the United States. Michael Kerr, CEO and Founder of NEHC; Bert Hunter, EVP and Chief Investment Officer for the CT Green Bank; Denise Nappier, CT State Treasurer; and Mary Sotos, Deputy Commissioner, Energy for CT all delivered remarks celebrating the milestone project and the nature of the private/public partnership to complete the project. The City of Meriden will benefit directly from the green, zero emissions electricity through five city facilities under a power purchase agreement developed under Connecticut's virtual net metering provision. The project is fish and environmental friendly and is expected to produce 920,000 kW hours of power each year for many years to come, all of which will be purchased by the City.